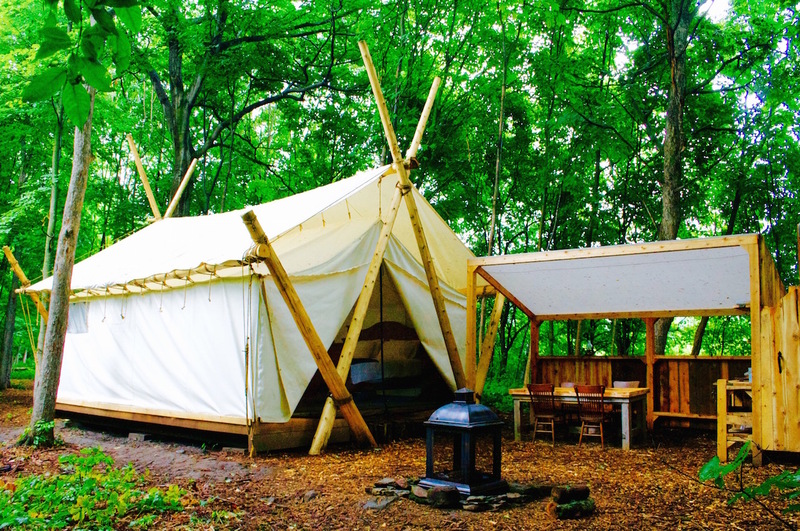 Luxury camping allows you to fully experience the beauty of nature with the space and comfort to truly appreciate it. 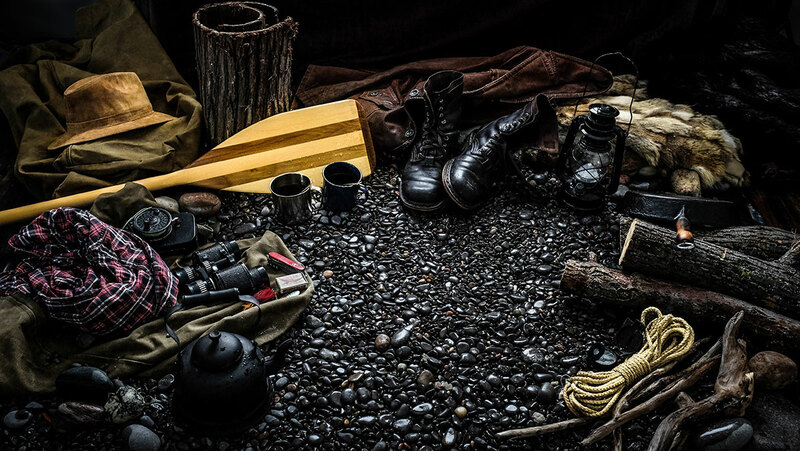 Our large canvas tents are an authentic tribute to the early prospecting days of our nation and are still used to explore some of Canada’s most wild places. We’ve since added a few luxuries to make your stay at Fronterra a great experience including a king-sized bed, hardwood floors, an ensuite bathroom, a reading lounge and even a private outdoor hot shower. Each tent-suite is designed in its own rustic-chic style and offers large private living spaces with protected areas to keep nature’s nuisances out while letting the gentle breeze and sunshine in. 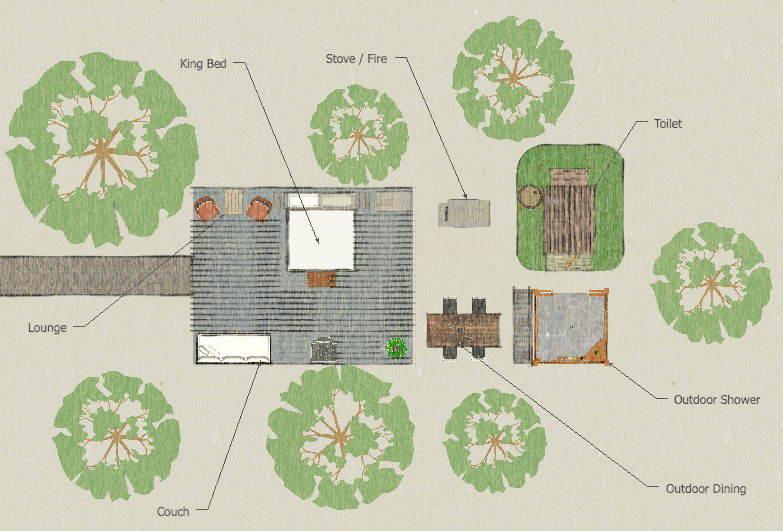 The private summer kitchen offers rugged cast iron cookware, charcoal grill, icebox, tableware complete with wine & beer glasses for a deluxe meal with vegetables sourced right from our gardens and eggs from our coop.  Fronterra is designed as a premium boutique camp with a limited number of tent-suites placed spaciously apart to ensure your time with us is rejuvenating and enjoyable. Each tent-suite is situated to maximize your privacy while still keeping you close to our amenities. 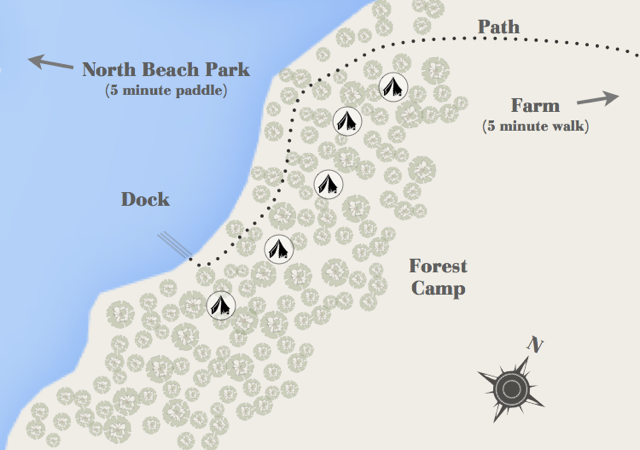 These amenities include a private dock with water access to the beautiful beaches of North Beach Provincial Park just a 5 minute paddle away and great fishing in North Bay. Other amenities include our permaculture vegetable gardens to source great farm fresh veggies, our chicken coop for fresh organic eggs and our Farm Outpost for basic camp provisions and local products. It is important to note that to keep the camp quiet and visually pristine, we have off-set the camp from overnight guest parking by a short 5 minute walk (300m). We offer a private valet service to transport your gear to your tent-suite free of charge. 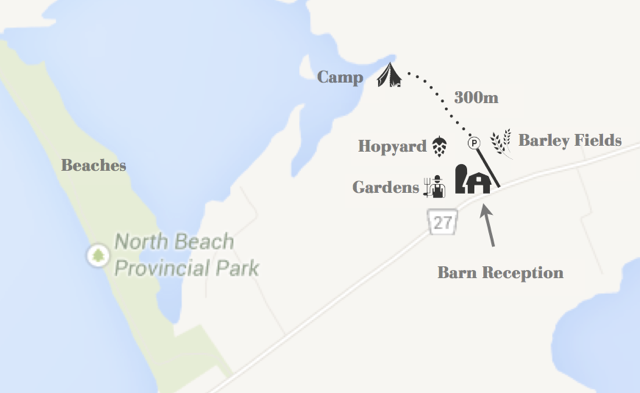 In addition to the magnificent North Beach fronting on both North Bay and Lake Ontario just a few minutes walk or paddle away and our ongoing workshops, Fronterra is ideally situated to explore Prince Edward County either by bike, boat or foot. With more than 20 vineyards located within a 10km radius all connected conveniently by quiet county roads and numerous tourism trails, having a bike or a good set of walking shoes is a must. The picturesque towns of Wellington and Bloomfield are just a short drive away for any town convenience you may need. Fronterra offers canoe and bike rentals for our clients (limited availability, please request during reservation). We can also arrange numerous services and packages for our clients including private camp chefs, group wine tours, salmon fishing, fly fishing and photographing outings to name a few (subject to availability).